Music artist Billy Bragg's history of Skiffle is a remarkable book. For those who don't know, Skiffle is music made in the United Kingdom by people (not all trained musicians) who used homemade instruments, including guitars, to perform blues and folk music, mostly that came from the United States. Lead Belly was the leading performer and songwriter that these young British musicians admired the most, and generally, it is their version of his songs which became popular and in turn, inspired rock 'n' roll in England. Nothing is by itself, and this narrative has the cold war politics as well as how the recording industry operated and tried to control their airways. The power of the teenager, both as a creative force as well as an economic strength is part of this story as well. Bragg did a magnificent job in capturing this large movement on these pages. The book is full of fascinating characters such as Ken Colyer, Lonnie Donegan (Skiffle's Elvis in one sense), Joe Meek and the whole traditional jazz scene, especially in Soho London. 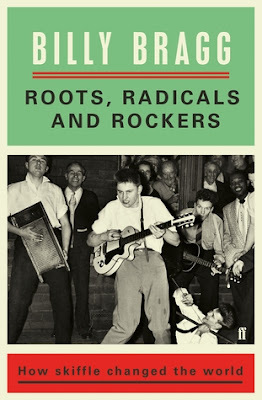 I have always been fascinated with the post-war years in London, and "Roots, Radicals and Rockers" is a wonderful journey into the world of contemporary music of that time. Also, fascinating to me is how another culture borrows from another to make something new. I would also recommend this book to anyone who is interested in British Punk rock because they share a similar DIY practice.